Watermark Plus is an easy and intuitive bulk photo converter that lets you add text/image watermarks, resize and rename a bunch of photos at a time. It’s the most effective way to protect photo copyright from unauthorized using. 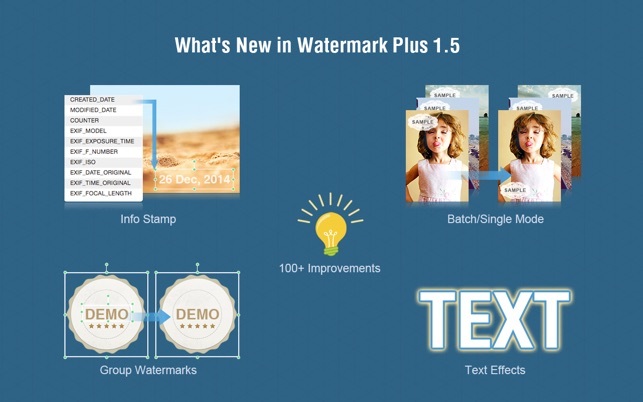 Watermark Plus lets you add text, image, script, symbol or other info stamps to multiple photos, and it will auto-adjust your watermark for each photo to best fit its size. You are free to choose any one of the 17 built-in profiles as watermark or save your own commonly used watermark for repeated use. What’s even better is that every step of the process can be previewed in real time with high speed. •	Support importing all common image formats like JPEG, TIFF, BMP, PNG, etc. •	Support zooming in and out to view the photos. •	WYSIWYG - Adjust your watermark with real-time preview before converting. 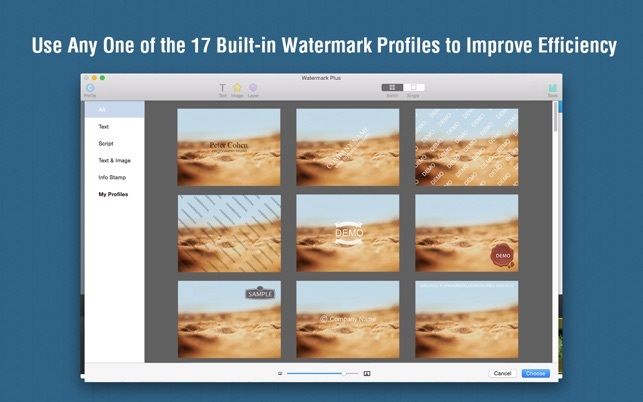 •	17 built-in watermark profiles. 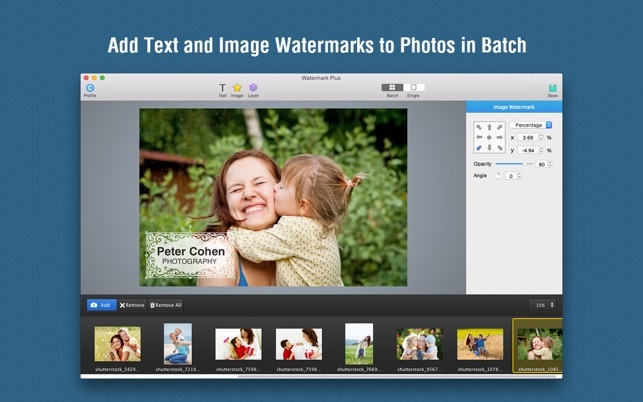 •	Apply image and text watermark to hundreds of your photos in batches. •	Support saving text/image watermark as Profile for easy and quick use later. •	Script watermark - Fill your photos with text tags. Text adjustment options are also available. •	Support inserting info stamp as watermark, such as created date, EXIF info, etc. •	Support adding several text/image watermarks at once. Group/Ungroup them as a whole for easy operation. •	Freely adjust watermark’s layer and opacity. Position and rotate it anywhere you want. •	Single Mode - Watermark on each photo can be separately adjusted with different position. •	Auto snap watermark to photo/objects. •	Quickly place watermark with the relative controller. 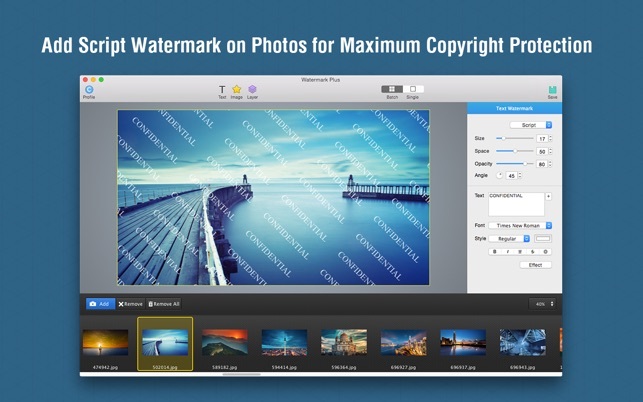 •	Automatically fit watermarks to different size of the photos. •	Free to customize text font, style, color, alignment, etc. •	Set Stroke, Glow/Shadow Effect for text watermark. •	Batch resize the photos by Width, Height, Percentage, or Fit Size. 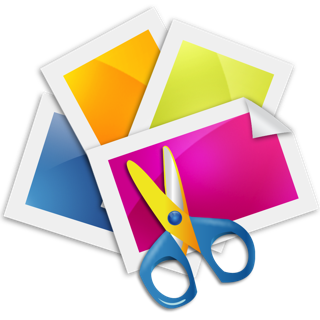 •	Batch convert your photos to JPEG, PNG, BMP and TIFF. 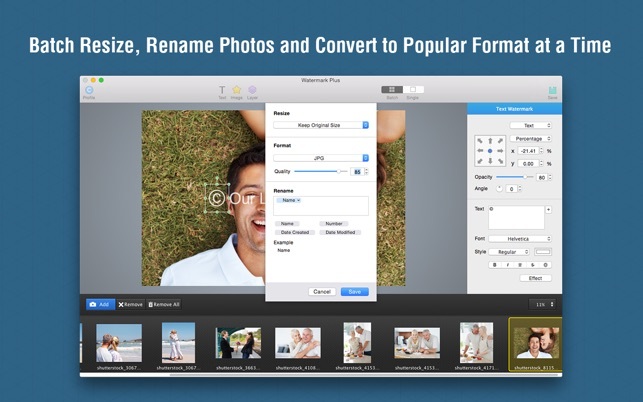 •	Flexibly rename photos at a time. Add wildcard characters such as Numbers, Date Created and Date Modified to fit your needs. We’ve been using Watermark Plus for over a year now to watermark pictures for our small business. It’s reliable, easy and fast to use which is great because being a complete DIY business we have little time to devote to complex or intense graphics programs. 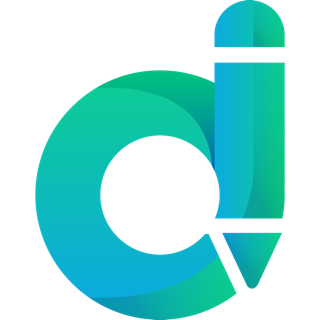 The App is reasonably flexible and the ability to store your own design profiles to be used at a click is a wonderful time saver. By creatively pushing the limits of Watermark plus we’ve even been able to produce ads for magazines as well as signs and stickers. Thanks to the folks at Watermark Plus for expanding our branding and graphics capabilities without requiring a degree in or natural ability for computer graphics. One suggestion: it would be nice to be able to do multiple lines or return bar spacing for an individual watermark. Otherwise we think Watermark Plus is Fantastic. The easiest thing I do for my Business! I love this app! It is extremely easy to use once I watched their tutorial! I like that I can do one photo or several at a time! Best thing I purchased for my business since the label maker! Definitely worth the money! I have used Watermark Plus for over a year without any problems. I have watermarked up to 5000 pictures at a time with no problem. Thank y’all for the product.